Of all the holiday makeup launches, the one I really, really look forward to is the Dior holiday makeup, and this year's collection - Diorific State of Gold makeup collection - definitely lives up to my expectations, at least in terms of packaging. 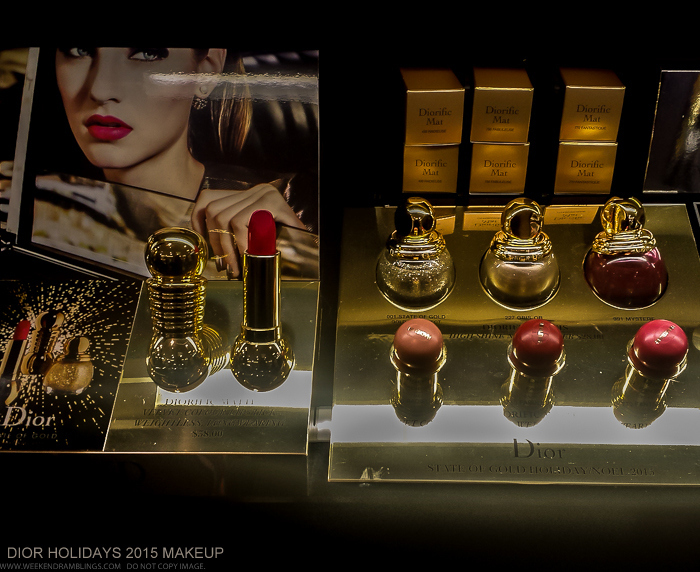 The Dior holiday 2015 collection follows what seems to have become an annual trend with luxe gold packaging and gorgeous red lipsticks and nail colors. Of course, there are other colors and products in there, but it's the lipstcks and nail colors that truly capture the festive spirit...for me. Also something to check out is the Dior Couture Smokey palette - a beautiful eye-lip palette - which I spotted at Sephora. I don't have swatches/photos of every product from the Dior holidays 2015 makeup collection, but here's a look at a few bits and bobs. 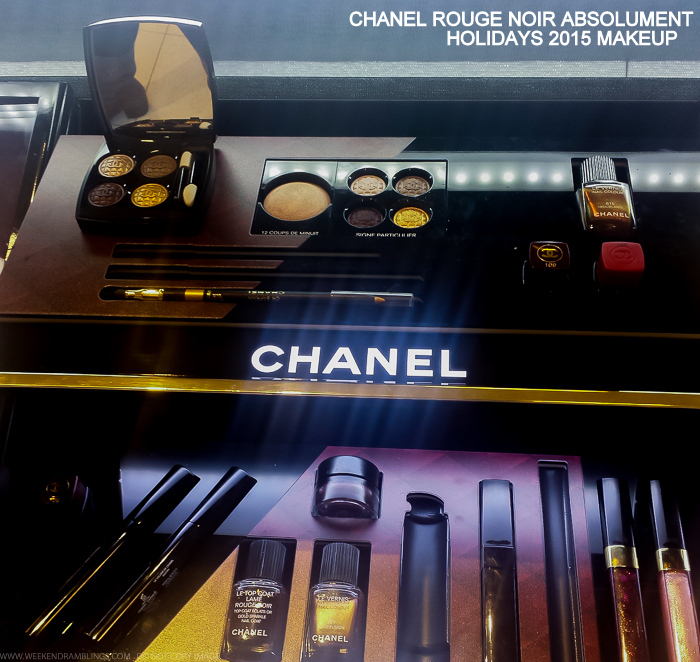 Chanel's Holiday 2015 Makeup collection, listed as Rouge Noir Absolument in some places and Vamp Attitude in others, is a gorgeous holiday collection inspired by the classic Chanel vampy nail color Rouge Noir. This deep dark glossy blackish red first appeared on the runway in 1994 with the Chanel Fall/Winter Ready-to-wear collection and soon became one of Chanel's most sought after colors. As is quite normal for Chanel, different "versions" of the color have been launched of this limited edition polish, all just as good but with little tweaks that set them aside from the original. If you are curious about the original Rouge Noir, you may be able to pick one now, released as part of the holiday 2015 collection Rouge Noir Absolument, but more on that in a bit. A limited edition eyeshadow quad, a beautiful dark Illusion D'Ombre, a couple of lipsticks, and eyeliners and mascaras all add to the vampy charm of the collection. Scroll on down for swatches of some of the products. The YSL Rouge Pur Couture lipsticks are an iconic product from the brand that's instantaneously recognizable with its luxe gold packaging and rich pigmented colors. This year, YSL revamped this lipstick line, but these new lipsticks look and feel just as amazing with luxurious pigmentation with the promise of intense hydration and antioxidant care. The lipsticks are available in matte as well as satin finishes. 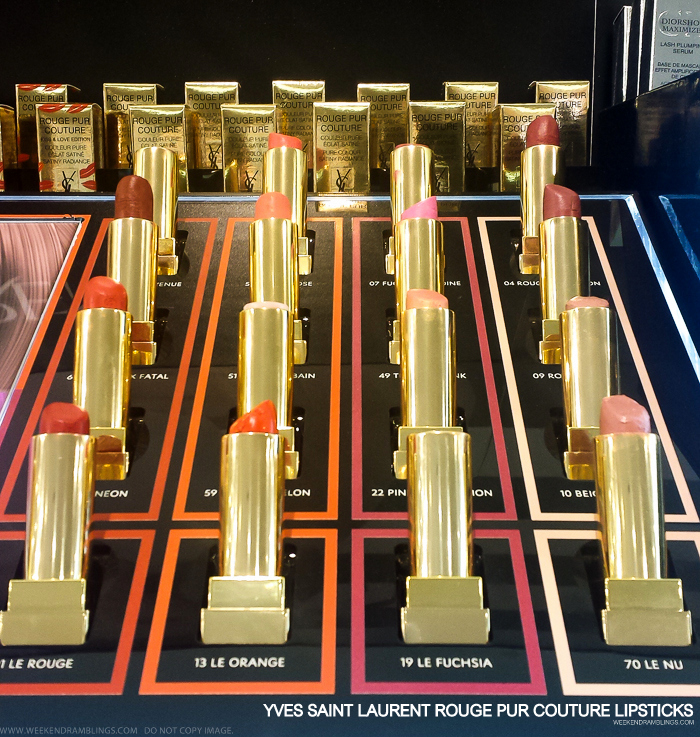 I have posted swatches of the YSL Rouge Pur Couture Mats range earlier. Scroll on for swatches of some of the lipsticks from the YSL Rouge Pur Couture Satin Radiance line. 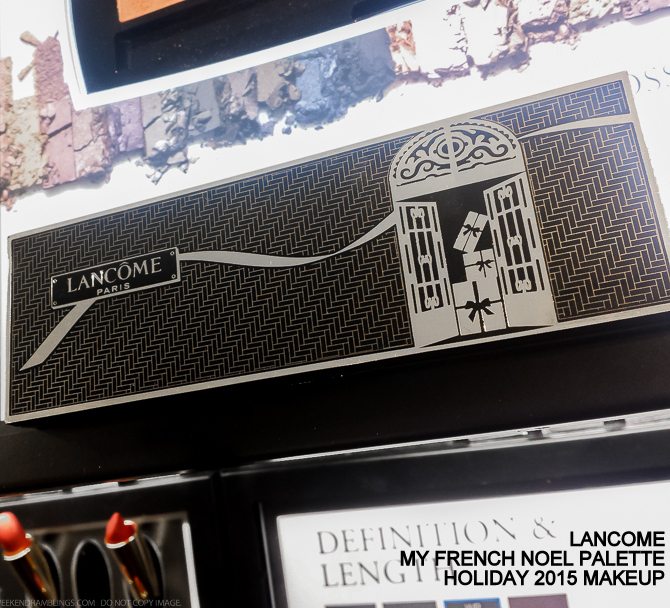 Lancome's new My French Noel Palette is a sleek lip-and-eye makeup palette that's perfect for the ultimate holiday look. Inspired by Parisian elegance, this palette features 6 eyeshadows as well as a hydrating lip base and two matte red lip colors. The eyeshadows include warm coppers and golds as well as plummy browns, perfect for creating a range of looks from neutral soft eye makeup looks to a darker smokey eye. The palette itself has a sleek, convenient packaging, with the 3 lip products seperated from the powder eyeshadows with a flap to keep the powders from mixing in with the sticky lip products. I don't own any palettes which combine creamy, and powder products like this palette does, and I have read enough reviews that complain about how messy it can get, but, the design of the Lancome My French Noel palette does seem like it should be easy to keep clean since there is a flap to keep the lip colors protected. Here's a look at more photos and swatches of this holiday palette.